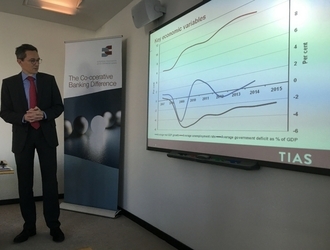 The EACB is pleased to announce the launch of a new publication entitled “A snapshot of Co-operative Banks in Europe” by TIAS School for Business and Society at Tilburg University. The publication reviews developments in the overall performance of 15 co-operative banking groups in 10 European countries. The average performance is compared to that of the entire banking sector in same countries. - The long term trend of an expanding member base continued in 2014: co-operative banks welcomed 1.3 million new members. - After an historical contraction in total assets and loans (lower than the contraction of that rest of the banking sector), balance sheets and loan growth resumed in 2014. Since 2011, fluctuations in co-operative banks’ total assets and loans have been moderated compared to all other banks. The composition of their balance sheet is structurally different. Co-operative banks are primarily focused on retail banking SMEs and households. - According to the analysis of the average return on equity (ROE) for the period 2002-2014 the ROE of co-operative banks exhibits a more stable pattern over a longer time period. Moreover the levels of ROE of co-operative banks outperformed the rest of the banking sector since 2008, showing that different banking models are causing different reactions to economic upswings and recessions. This underscores the need for diversity in banking for the sake of stability. - Analysis also look at other indicators including market shares, cost/income ratio and Tier 1 Capital. The TIAS Report concludes that co-operative banks engage in fewer and more stable business which secures stability in their performance. Their contribution is key to diversity in banking. The impact of (new) banking rules varies across banks with different ownership structures. Regulatory measures should not enforce convergence of business models and /nor the introduction of aspects of listed banks into well-capitalised listed banks with viable business models. To read the full publication, please download the PDF below.